Perhaps none so much as Miss Vickie, of Arthurdale, West Virginia. Arthurdale’s New Deal Festival celebrates the community’s rich history as First Lady Eleanor Roosevelt’s homestead subsistence project. The enterprise succeeded in some ways and failed in others, providing lessons for addressing some of the economic and social needs we face today. After a few hours of listening to historians and music, eating BBQ, and touring the community by hay wagon, I made my way to Miss Vickie’s Guest House. I was her first guest in a year because, despite its historical significance, rural Arthurdale doesn’t receive many overnight visitors. Pulling into the driveway at about 5:00 that evening I park my motorcycle to the side of Miss Vickie’s car. I notice that the hood is a different color from the rest of it, and deduce that it’s a replacement. Run-in with a deer? A few of the lethal beauties graze in the meadow across the street as I unbuckle my duffle from the seat. Despite the temperature, the diminutive Miss Vickie is sitting outside under a blanket, watching me and the deer. I later learn that her unassuming home has been reconstructed from two earlier structures in a coal camp: the superintendent’s home and a boarding house. I wish it were possible to interview this house that has seen so much history. I want to know the stories of working people considered too humble for documentary films and high school classrooms. When I introduce myself and drop my duffle beside her on the deck, her expression changes from politely cautious, to hospitably surprised. With a titter, she confesses that it never crossed her mind that her female guest might be riding a motorcycle. I head back to my bike to retrieve a few more things. 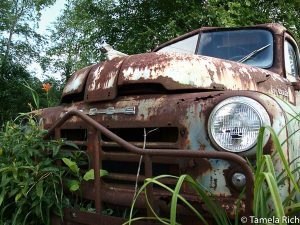 Looking over the windshield straight ahead of me, nested in a sea of dazzling orange daylilies, sits a 1950 Dodge Ram truck. A bright pink flamingo peeks out from the bed, which spills over in a riotous mix of summer flowers. Miss Vickie notices that I’m gawking and explains that she changes the plantings and decorations in the truck bed for each season. December always features lights, a Christmas tree in the bed, and a wreath around the hood ornament. Miss Vickie loves that old hood ornament; it’s a retro gem. Professional and amateur photographers frequently visit Miss Vickie’s, including those who hope to win calendar contests. The old Ram has helped a few of them do just that. Over dinner I’ll hear the story of the day that author Jeanne Mozier flew into Arthurdale in her husband’s private plane just to interview Miss Vickie and get a picture of the truck. “My truck’s in a book!” Miss Vickie beams, as she shows me a well-loved copy of Way Out in West Virginia: A Must-have Guide to the Oddities and Wonders of the Mountain State. The downturn of West Virginia’s coal industry has forced many rural residents to scramble for ways to keep body and soul together. Miss Vickie lives close enough to the university town of Morgantown that she can make her living cleaning houses there. She professes that she is truly blessed to have work that helps families cope with their big houses and bustling lives. She routinely brings them flowers from her garden, and home-baked goods when the flowers are dormant. In fact, Miss Vickie brings EVERYONE in her life flowers, from the grocery store checkout gal, to her medical team at WVU Medical in Morgantown, and the parking lot attendant there. You might even say she has a “flower ministry.” Her home is surrounded by flower beds that keep her ministry supplied. 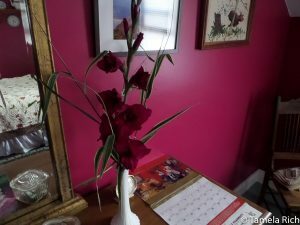 In my own room Miss Vickie has placed a vase of beautiful gladiolas that match the color of the walls. Had I chosen a different room, it would have been adorned with a different bouquet. 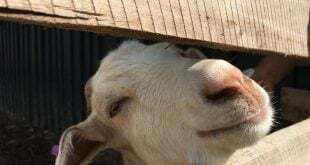 Miss Vickie has faced hardships and setbacks that are bigger than any of us would want to bear, and most of them are not mine to share here. One of them I can mention is a near-fatal car crash. When she awoke in the hospital at WVU, it was in the same room where her brother had passed away. Miss Vickie still needs follow-up care from WVU medical and dental students, who learn their professions by treating clinic patients like her. They always go home with flowers. She is a sparrow of a woman, because for a couple of years after the accident, she had to choose between the pain of chewing and hunger pangs. That explains why she sits outside under a blanket in the July heat. She truly has no body fat, something I dream about—but not at the price she paid. Despite what the world has thrown her way she is grateful for each day, each house to clean, each drop of rain for her garden, and each visitor who stays with her in unincorporated Arthurdale instead of driving to a town or city with a motel. In short, Miss Vickie is not troubled by the vicissitudes of life. 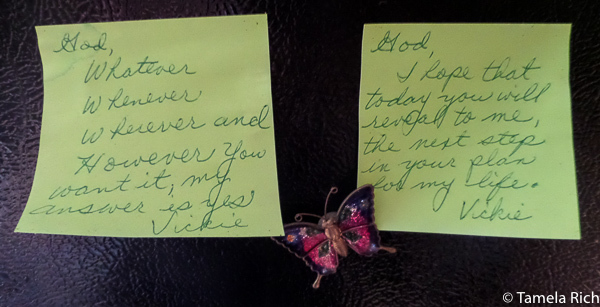 This photo of sticky notes on her refrigerator portrays her coping strategy. However you want it, my answer is yes in your plan for my life. We’ve all encountered zealots (religious and otherwise) determined to impress upon us their “witness.” A woman of faith myself, I am nevertheless put off—and at times even frightened—by religious fervor. Miss Vickie does not evangelize her house guests. More effectively, she embodies her faith by serving them. For example, when I asked where I could find a place to eat dinner, she insisted on cooking for me instead. Her eyes lit up and her mouth smiled broadly over her dentures when I accepted her gracious offer. Oh yes, I was truly doing her a favor by accepting her dinner invitation. When’s the last time you felt you were honoring someone when you accepted their offer of service? And when’s the last time you gave someone the feeling that you were honoring them with yours? 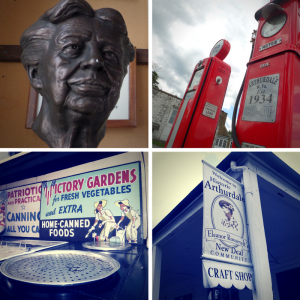 My visit with Miss Vickie in Arthurdale is a touchstone of tranquility for me. She showed me that saying “yes” to everything that comes your way—bidden or unbidden, welcome or unwelcome—is the only path to peace of mind. I anticipate that many of you would like to see a picture of Miss Vickie. Instead, I leave you with the indelible impression she left on my heart.